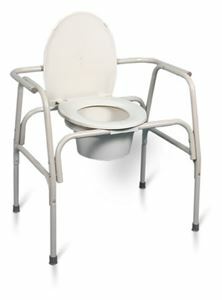 Extra Wide Heavy Duty Steel Commode by AMG is designed to provide comfort for those using Extra Wide Commode. It provides maximum seating capacity. It is made up of steel and rubber tips that are slip resistant. Rubber tips keeps the commode safe from slipping. Comes with a bucket, splash guard and a lid. Can hold upto a weight of 500 lbs.